When travelling through London one cannot but be amazed by the diversity of people on the streets. The variety of languages heard, foods available, types of dresses worn or gods worshipped seems endless. During the run-up to the announcement of the city that would host the 2012 Olympic Games, this multiculturalism in London was clearly promoted. London was advertised as ‘the most multicultural city in the world’. But multiculturalism as a concept is very specific to the UK and even more so to London. Other countries have adopted very different models of integration for new settlers of other origins. In France for example, immigrants have always been asked to ‘become French’, to integrate and follow very strict French systems of values. France is extremely diverse. It has absorbed more immigrants than any other European nation since the end of World War II, yet, when walking through Paris you feel distinctively in France. By opposition, when walking through parts of London you could be excused for believing that you have been transported in a foreign land. From the Sikh community of Southall to the Korean neighbourhood of New Malden, or the Bengali population of the East End and the Afro-Caribbean inhabitants of Brixton, London is a canvas of communities spread around the urban sprawl like a giant jigsaw. But is this multicultural model working? Are all these communities interacting and exchanging or are they all living in ghettoes of their own making? Shouldn’t the ‘multicultural’ model be an ‘intercultural’ model? Does the fact of having many communities side by side automatically grant the label of ‘diverse society’? Or should diversity imply that communities share values and aspire for a common aim for their city? In 2005, when multiculturalism was at the top of the agenda in London, with the hype surrounding the London 2012 bid, I decided to study the city’s diversity. In order to do so I aimed at photographing people from every country in the world around the city. I decided to follow the Olympic list of nations as it was very fitting at the time and it is also slightly more ‘neutral’ than other lists (not all countries agree on the amount of independent nations on the planet). This list was made up of 202 nations at the time. At least two new nations have appeared since I completed the project; one of them, Kosovo, not fully recognised as an independent country yet (not by everybody anyway). 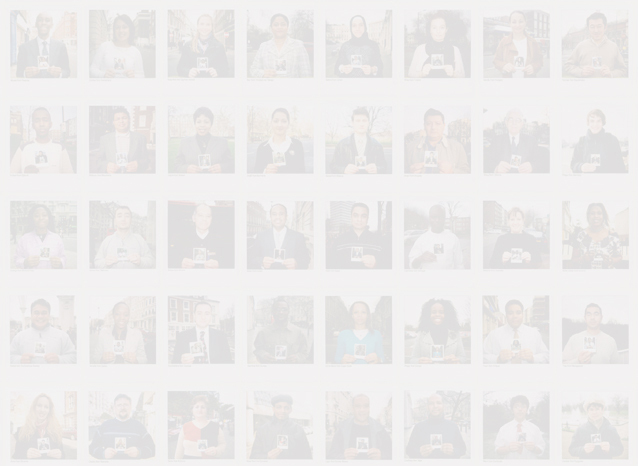 I chose to photograph each of these Londoners using a Polaroid instant camera. This choice was motivated by many factors. Polaroid images are instantaneous. That would enable me to share the images with my ‘models’. I also find that there is a joyous connotation attached to Polaroid pictures. They are quite festive and linked to special events or celebrations. They are also unique. Instant images are in fact close to the original photographic process elaborated by Daguerre in the late 1830s. This uniqueness gives the project an historic value. I asked each person to pose holding the image of the previous Londoner photographed. In doing so I created a continuous chain. Because each Polaroid image is unique, once I photographed someone I could not alter any of the images previously taken. The last Londoner photographed holds an image which has in its core the portraits of Londoners from every nation on earth. It is not visible to the naked eye, but in theory the grain of this photograph has been affected by what was photographed before. To prove it I created an animated version of the work in which the viewer can zoom into the images all the way from the last to the first Londoner (both UK Londoners, to create a loop). My ‘models’ holding the images of the previous Londoners photographed is also a metaphor to the Olympic flame and to the notion of interculturalism rather than multiculturalism. What interested me was the idea of people from all communities meeting up at some point. Completing this project has been a near two years long struggle. Starting confidently by photographing a dozen people I knew, I soon realised that it would be a lot more difficult than I already expected. I originally planned to follow a reverse alphabetic order, but I quickly decided to photograph people as I found them. All that is left of this idea is that the second and second last Londoners are from Zimbabwe and Afghanistan respectively. I tried as much as possible to avoid embassies, universities and tourist offices, but I did in some cases. Reflecting on that, I have come to the conclusion that Ambassadors or students are Londoners after all. I know for fact that some of the people I photographed have since left London, which is also very telling about the city: people from all corner of the planet come here… and others go. London is in constant fluctuation. I also had to ‘cheat’ for five of the nations represented (five that I know of: I never checked passports). For these five nations I chose someone linked in some way to this place: has lived there, has family there, or even, in the case of Nauru, I settled for someone who knew where it was. In 2007 Owen Powell and Alex Horne started their own "World in One City". Our projects differ slightly but the idea is the same: proving that London is the most multicultural place in the world. I would like to express my sincere gratitude to all the people who have posed for this project and who make London the great city it is. I would finally like to dedicate this work to my son, Luca, who is the greatest example of London’s interculturalism: where communities meet. He was born in Chelsea, of an Irish mother and a French father.